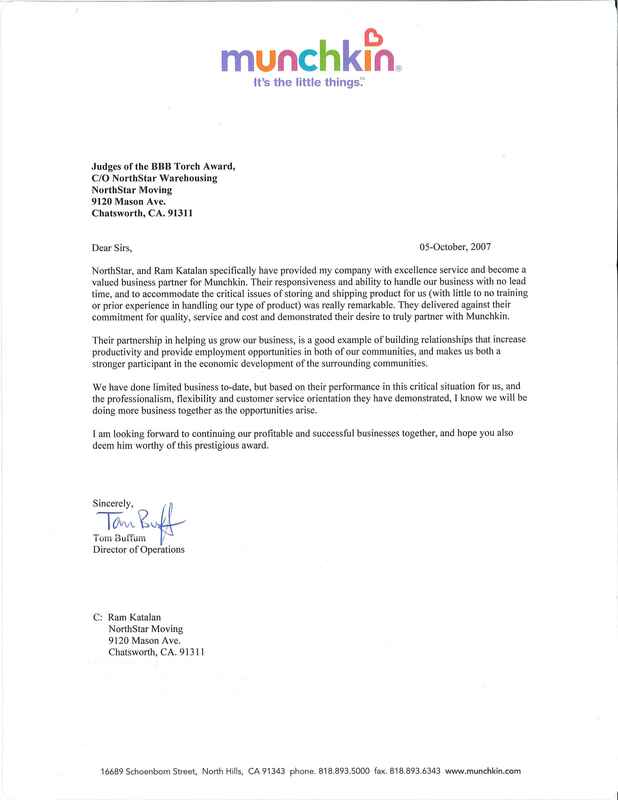 NorthStar and Ram Katalan specifically have provided my company with excellence service and become a valued business partner for Munchkin. Their responsiveness and ability to handle our business with no lead time, and to accommodate the critical issues of storing and shipping product for us (with little to no training or prior experience in handling our type of product) was really remarkable. They delivered against their commitment for quality, service and cost and demonstrated their desire to truly partner with Munchkin. Their partnership in helping us grow our business, is a good example of building relationships that increase productivity and provide employment opportunities in both of our communities, and makes us both a stronger participant in the economic development of the surrounding communities. We have done limited business to-date, but based on their performance in this critical situation for us, and the professionalism, flexibility and customer service orientation they have demonstrated, I know we will be doing more business together as the opportunities arise. I am looking forward to continuing our profitable and successful businesses together, and hope you also deem him worthy of this prestigious award.